A 38-digit precision math emulator for properly fitting high order polynomials and rationals. A robust fitting capability for nonlinear fitting that effectively copes with outliers and a wide dynamic Y data range. An AI Expert option that automatically selects the appropriate peak, transition or kinetics models for you. Fit all of TableCurve 2Ds 3,665 built-in equations or just the ones you need  instantly! With TableCurve 2D, a single mouse click is all it takes to start the automated curve fitting process there is no set up required. TableCurve saves you precious time because it takes the endless trial and error out of curve fitting. Up to 15 user-defined equations can be entered and ranked along with the built-in equations. These specialized models can contain most mathematical constructs, including special functions, series convergence and conditional statements, differentiations, integrations, and parameter constraints. And, unlike most curve fitting programs, TableCurve 2D's user-defined functions are compiled so custom curve fitting can be performed quickly -- at nearly the speed as with the built-in equations. You can also add up to 100 external C or FORTRAN language functions to the TableCurve 2D equation set. These equations and constraints can be of unlimited complexity. Increase the accuracy of your predictions with state-of-the-art AR (Autoregressive) procedures that offer the means to effectively extrapolate any data set. Select from any one of the 9 different procedures for extrapolating your data - 3 to predict ahead, 3 to predict earlier data, and 3 that predict in both directions. Of these algorithms, six offer in-situ noise removal using advanced SVD and Eigendecomposition methods. Once your XY data have been fit, TableCurve automatically sorts and plots the fitted equations by the statistical criteria you select (r2, DOF adjusted r2, Fit Standard Error or the F Statistic). Graphically review the fitted results as you scroll through the equation list. 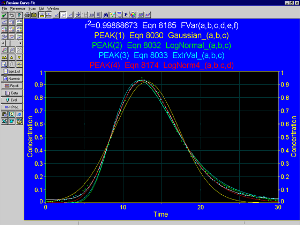 A residuals graph as well as parameter output are generated for each fitted equation. Add confidence and prediction intervals to the graph to detect outliers in your data. Data, statistical and numeric summaries are also available from within the Review Curve Fit window so you can further analyze fit results. TableCurve gives you all the information you need to discover the model that best meets your requirements for the ideal fit. Data, statistical and precision summaries are available so you can further analyze fit results. These summaries can be simultaneously displayed and are automatically updated when a different equation is selected for review. Evaluation option with automated table generation, includes function, derivatives, roots and cumulative area. TableCurve 2D offers state-of-the-art smoothing and denoising techniques to remove the noise in your data. Select from a total of 6 smoothing/denoising algorithms. Of special importance is the Eigendecomposition Denoising, a non-parametric procedure where separation is based on signal strength. For Fourier Denoising, TableCurve 2D offers a data taper to minimize spectral leakage and the means to filter either by the magnitude of FFT channels or by frequency threshold. 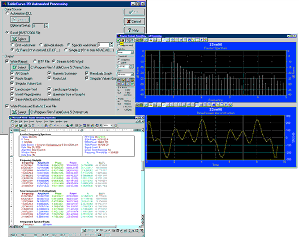 Inspect analytic derivatives for all built-in equations, as well as all of the smoothing procedures. Mask outliers and refit your data. With TableCurve 2D, its all so easy! For those rare equations that cannot be adequately managed by a parametric model, TableCurve 2D offers three non-parametric estimation procedures. 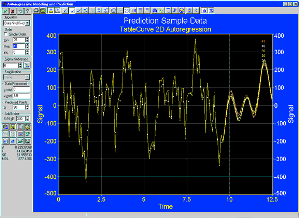 The Spline, Smoothing Spline and Local Regression options offer true state-of-the-art algorithms. For example, there are seven different spline algorithms, including two least-squares minimizations and the non-uniform n.
With TableCurve you can preview your graph and output publication-quality graphs in several different configurations. You can also produce files containing data and equations in Lotus, Excel, ASCII, Harvard Graphics and SigmaPlot formats. TableCurve 2D can speed up your programming by generating actual function code and test routines for all fitted equations in FORTRAN, C, Basic, Pascal and VBA for Excel. Save time with the new unattended batch processing capability to automatically process a large number of data sets - no programming required! With this integrated automation capability, you can analyze a large number of data sets while you are away from your PC! TableCurve 2D automatically generates the output for each data set. The output can be written to an MS Word (or generic RTF) file for all graphs and numeric summaries, and to MS Excel for numeric data. The automation capability is available for all of TableCurve 2D's major procedures. Copyright © 2014 Systat Software Inc. - All Rights Reserved.